On arriving in Srinagar, our representative will help you check-in the hotel and then will assist you with the sightseeing of Srinagar. Overnight stay in hotel in Srinagar. Today, we will drive through the villages of Ganderbal in Sind valley to reach Chattargul. On the same day, we shall trek from Chatturgul to Mahlish. Overnight stay in Mahlish. We shall be walking through the meadows of Mahlish, where we can see the alpine flowers. 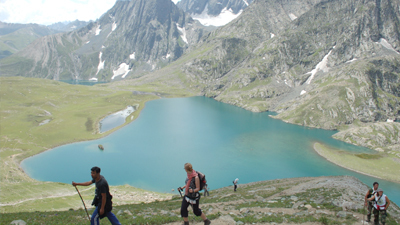 Our trail will be via Kolsar Lake. Overnight stay near Gangabal Lake. Today, we shall leave for Trunkul from Gangabal. Here, we will try our hand in fishing. Overnight stay in Trunkul. We will leave for Srinagar today. In the morning, we will be trekking through meadows of Bodpathri and Trunkhol and then we shall descend to Butsheri to reach Naranag. From Naranag, we shall drive two hours to reach Srinagar. Overnight stay at houseboat in Srinagar. Our representative will assist you to Srinagar airport. Depending upon the flight schedule, a short sightseeing trip can be organized in Srinagar.